What is an Alternative vet exam? An alternative exam can cover different things depending on your vet’s holistic specialties. In Dr. Frank’s practice an alternative exam is a Traditional Chinese Veterinary Medicine (TCVM) exam. 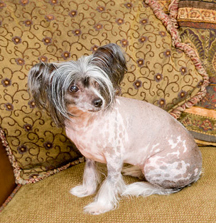 In honor of talking about Traditional Chinese Veterinary Medicine, today we have a photo Dr. Frank’s very sweet, soft and silky Chinese Crested dog, Punky. In the photo, Punky is waiting for Dr. Frank on the couch in our reception area. On to Harmony’s alternative exam. Dr. Frank: TCVM stands for Traditional Chinese Veterinary Medicine. A Traditional Chinese Veterinary Medicine exam is very different from a conventional Western Medicine exam. The first thing you will notice is a TCVM exam is a much lengthier exam – approximately 1 hour. With this exam your vet will then determine if acupuncture and/or herbs are recommended. In Traditional Chinese Veterinary Medicine the basis of an illness is diagnosed by means of understanding the individual pet’s constitution in addition to noting the outward symptoms. In a TCVM exam the vet will ask questions about your pet’s behavior and preferences such as whether your dog or cat is afraid of thunderstorms, wind or loud noises. Your vet will want to know things like if your pet likes children. Does he or she like to bathe in the sun? Does your pet prefer to sleep on hard surfaces? These are just an example of the types of questions your vet may ask during a TCVM exam. Your answers will give the vet important information about underlying imbalances in your pet which can allow an illness to become symptomatic. Your vet will then correct your pet’s imbalances through Traditional Chinese Veterinary Medicine by the use of herbs, acupuncture and food. 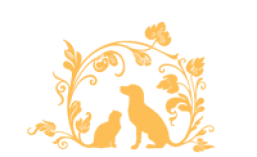 This entry was posted in Acupuncture, All, Cats, Dogs, Herbs, Holistic Care and tagged acupuncture, alternative veterinary, cat vet, Chinese herbs, dog vet, holistic vet, small animal vet, tcvm, veterinary, veterinary medicine, vets in monroe. Bookmark the permalink. I just have to say that I have taken my dogs to an alternative vet for many years, but after seeing that my dogs were so uncomfortable with the vet, we decided to find a new one. We found Dr. Frank. He is the ONLY vet where my dogs DRAG ME INTO the clinic and joyfully greet everyone. Even though they have had acupuncture, and minor surgeries there, they are always happy to come back! Dr. Frank is kind, caring and gentle with the animals. His method of deciding which is the best procedure to use for the animals current condition is welcomed and very appreciated. He takes time to discuss and explain what is going on and to share his thoughts. I highly recommend the TCVM visits as they are very well worth it!